A new classic, cited by leaders and media around the globe as a highly recommended read for anyone interested in innovation. 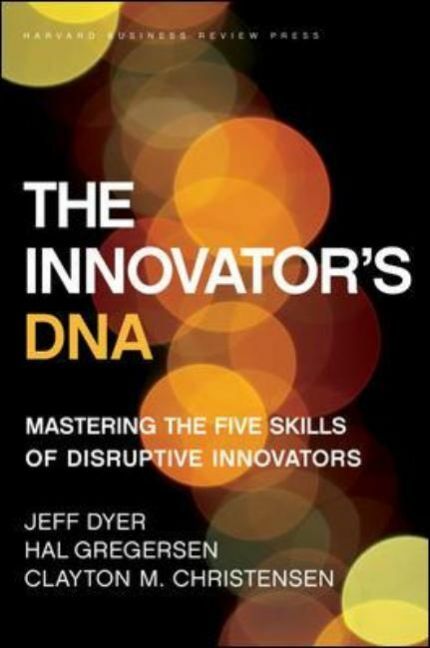 In The Innovator's DNA , authors Jeffrey Dyer, Hal Gregersen, and bestselling author Clayton Christensen ( The Innovator's Dilemma , The Innovator's Solution , How Will You Measure Your Life? ) build on what we know about disruptive innovation to show how individuals can develop the skills necessary to move progressively from idea to impact. By identifying behaviors of the world's best innovators&amp;#151;from leaders at Amazon and Apple to those at Google, Skype, and Virgin Group&amp;#151;the authors outline five discovery skills that distinguish innovative entrepreneurs and executives from ordinary managers: Associating, Questioning, Observing, Networking, and Experimenting. Once you master these competencies (the authors provide a self-assessment for rating your own innovator's DNA), the authors explain how to generate ideas, collaborate to implement them, and build innovation skills throughout the organization to result in a competitive edge. This innovation advantage will translate into a premium in your company's stock price&amp;#151;an innovation premium&amp;#151;which is possible only by building the code for innovation right into your organization's people, processes, and guiding philosophies. Practical and provocative, The Innovator's DNA is an essential resource for individuals and teams who want to strengthen their innovative prowess. Jeffrey Dyer is the Horace Beesley Professor of Strategy at the Marriott School, Brigham Young University. He is widely published in strategy and business journals and was the fourth most cited management scholar in 1996-2006. Hal Gregersen is a professor of leadership at INSEAD. He consults to organizations around the world on innovation, globalization, and transformation and has published extensively in leading academic and business journals. Clayton M. Christensen is the Kim B. Clark Professor of Business Administration at Harvard Business School and the architect of and the world's foremost authority on disruptive innovation.